Joe Johnston has an incredible resume, no doubt about that, but he's also the guy who routinely directs the worst movie of any franchise. He's the one who gave us Captain America: The First Avenger and Jurassic Park 3, two movies nobody mentions during discussions of the best Marvel or Jurassic Park films ever. So while he's assisted on Star Wars and Indiana Jones also directed Jumanji, The Rocketeer, and more, he's hardly a sure thing for the revived Narnia franchise that he just became a part of. Johnston will direct Narnia: The Silver Chair, the fourth recent live-action adaptation of C.S. Lewis' popular series of novels. 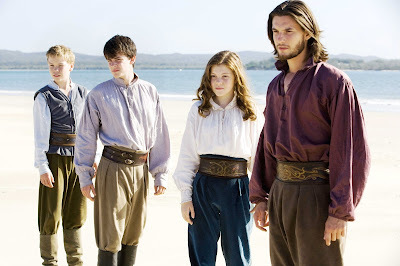 He'll be charged with pumping life into them after The Lion, the Witch and the Wardrobe, Prince Caspian, and Voyage of the Dawn Treader failed to be the breakout hits they probably should have been. These books are held in equal esteem as Tolkien's The Lord of the Rings, but there's simply no competition when it comes to the big screen. Two-time Oscar nominated Life of Pi writer David Magee will be penning the script. This will be the first film not to follow the Pevensie kids, and will instead focus on the unfortunately-named Eustace Scrubb, who was last played by Will Poulter. Doubtful he'll be coming back to reprise the role. The story follows Eustace and his school friend Jill Pole as they journey to Narnia to rescue Prince Caspian's son, who has been kidnapped. Johnston's not a bad choice and is really good at telling nostalgic adventure stories. He could potentially revive this franchise which has earned $1.6B worldwide. But he's not a particularly inspiring choice, either, and is just as prone to work that is utterly forgettable.